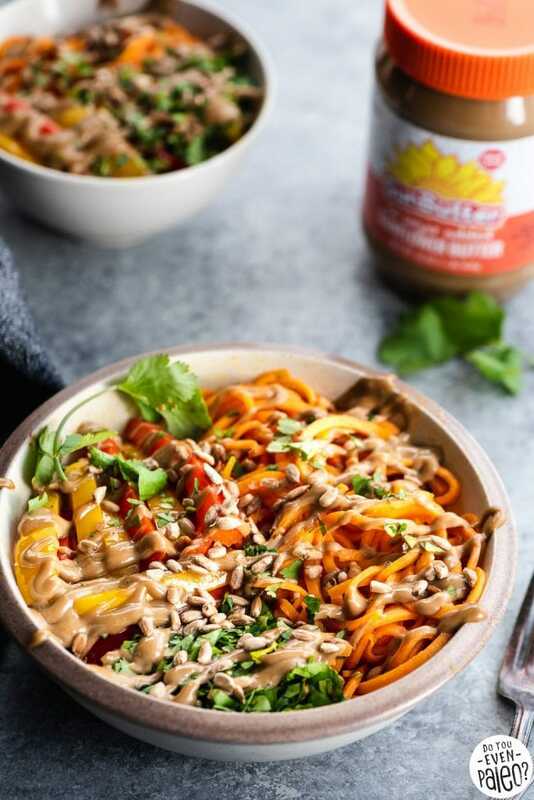 This Thai Sweet Potato Noodle Bowls recipe and the accompanying post are sponsored by Sunbutter®! All experiences and opinions are my own. 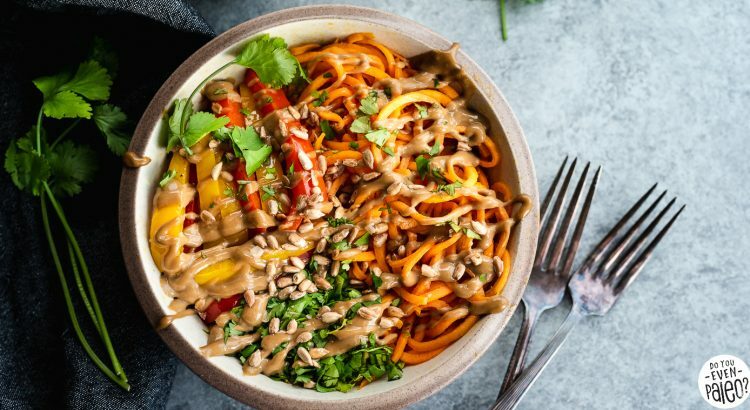 Veggies and a sunflower seed butter-based Thai sauce take the stage for this easy noodle bowl recipe. 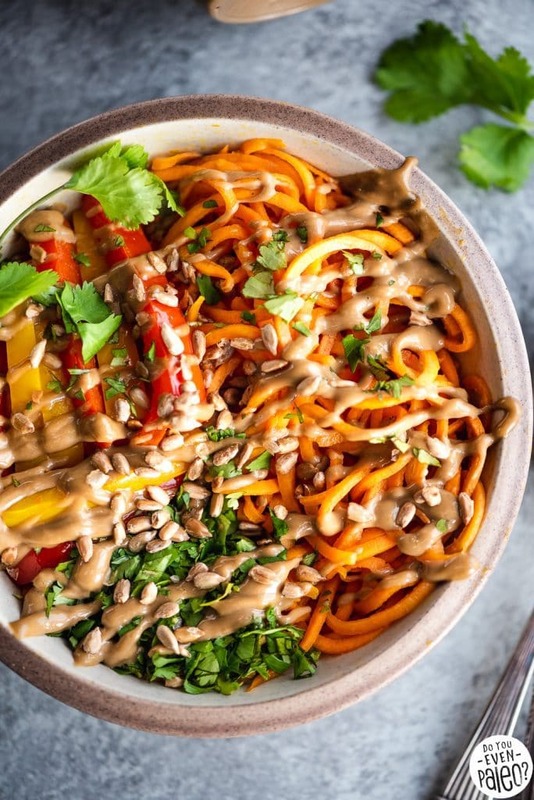 Sweet potato noodles become the vibrant backdrop for bell peppers, cilantro, basil, and crunchy sunflower seeds. Want to make it a full meal? Add some protein in the form of pan-fried or poached chicken breast! When I went paleo, sunflower seed butter quickly became my go-to swap for peanut butter in all manner of recipes. Frankly, the taste is much closer to peanut butter than any other nut or seed butter! And when I say that I use it in all manner of recipes, I mean it. Like peanut butter, sunflower seed butter can be used in sweet and savory recipes. 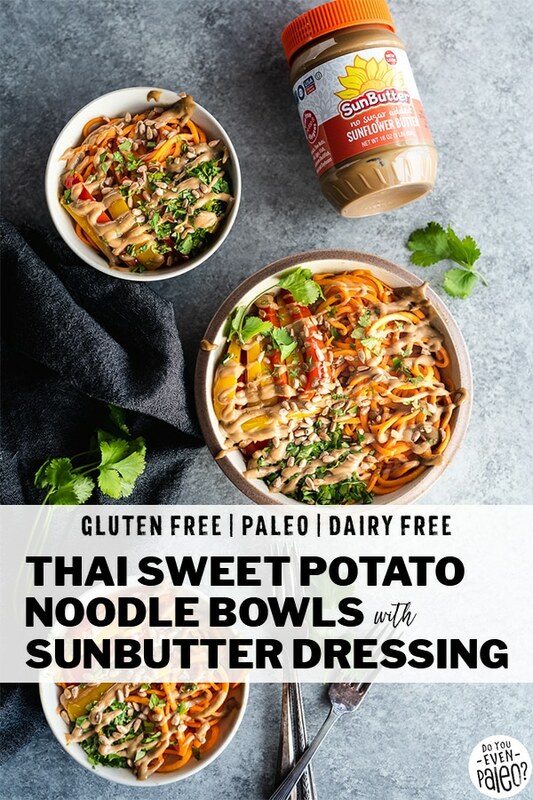 Sunbutter Sweet Potato Brownies and Thai Cabbage Salad with Sunbutter Dressing are two of my faves on opposite ends of the spectrum! Beyond the flavor (which is numero uno), sunflower seeds provide a dose of nutrients! Sunflower seed butter is high in Vitamin E, the body’s main fat-soluble antioxidant. Sunflower seeds are a good source of magnesium, one of the most vital minerals in the body. Magnesium is important for bone health, muscle health, nerve health, and energy production, to name a few. I knew about Sunbutter long before I ever went paleo or nurtured my interest in cooking. One of my cousins has been deathly allergic to peanuts since she was a baby. After my aunt found out, she quickly went on the hunt for peanut alternatives — one of the first companies she found was Sunbutter! Because of that, Sunbutter was already on my radar when I went paleo and stopped eating peanut butter so frequently. 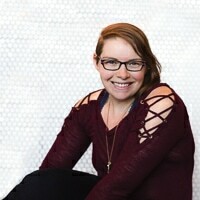 Sunbutter’s home is in Fargo, ND, which is another reason I love the company. Of course, if you’re new around here: I also live in Fargo! Working with the leading sunflower seed butter brand, which happens to be located in my backyard, is simply amazing. Sunbutter creates their products with US grown and roasted sunflower seeds. 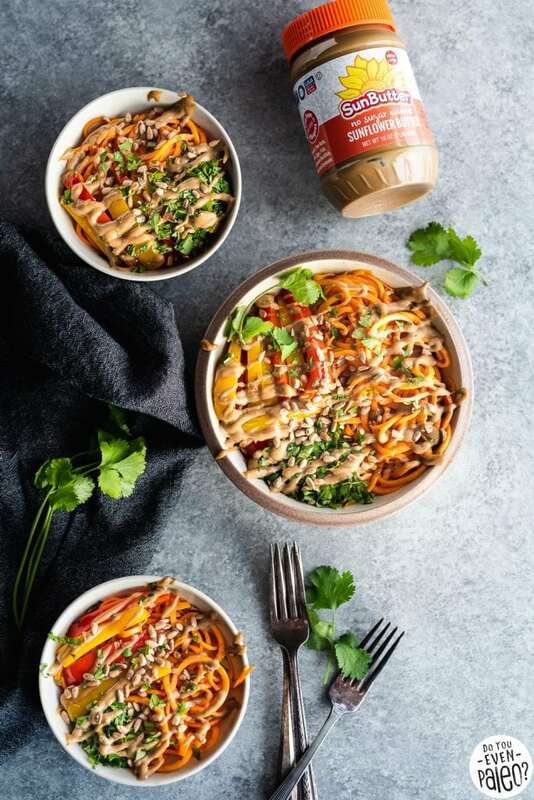 They promise their products are free from the top 8 allergens, including peanuts, tree nuts, soy, milk, eggs, wheat, fish, and crustacean shellfish. And uses only non-GMO sunflowers for their products. Before we get to the recipe, we’ve got to talk about sweet potato noodles. I’m guessing you’ve heard of a spiralizer by now. They were all the rage a couple years ago! If you haven’t, it’s a kitchen tool that allows you to turn veggies into noodles. 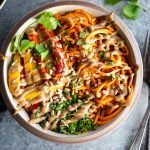 The crescendo of the trend may have passed by this point, but I’m deep in the throes of spiralizer love right now, which is how they became a big part of these thai sweet potato noodle bowls. 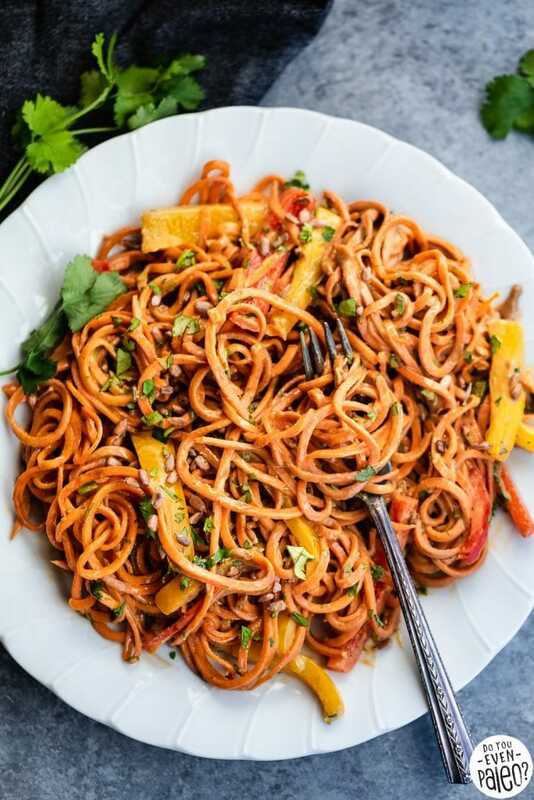 You can cook the sweet potato noodles multiple ways, but for this recipe you’ll saute them in a hot skillet with plenty of olive oil. You need olive oil so the sweet potato doesn’t stick (if you find they’re sticking to your pan, this is why)! Then you’ll keep tossing and turning the noodles with kitchen tongs for 5-7 minutes. It doesn’t seem like a long time, but that’s the sweet spot. 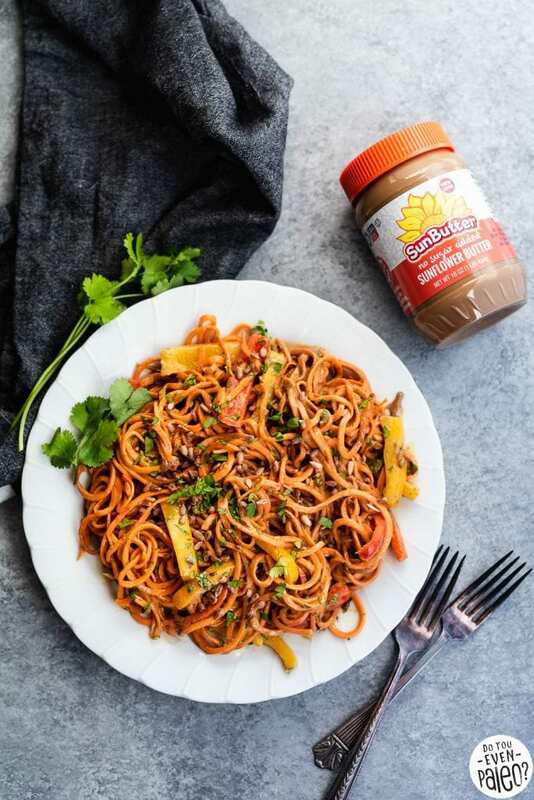 Now… Get the spiralizer, grab a jar of No Sugar Added Sunbutter, and let’s get cooking! 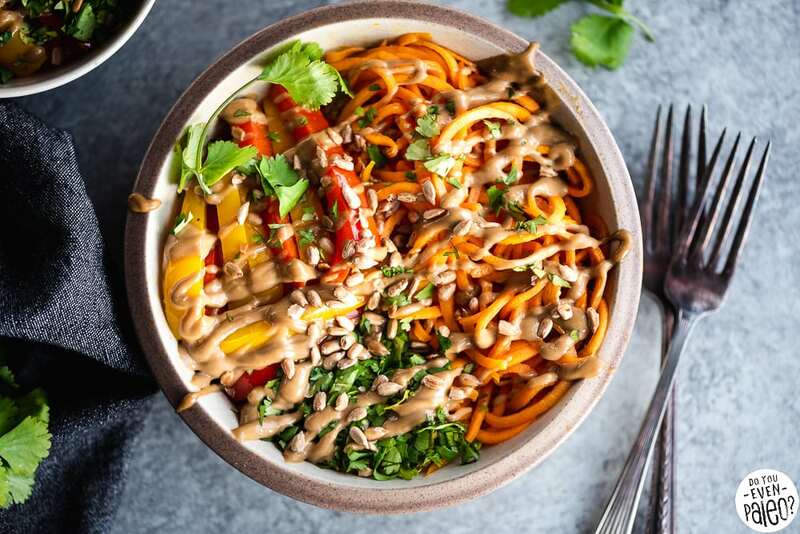 You’ll need a vegetable spiralizer for these Thai Sweet Potato Noodle Bowls with Sunbutter Dressing. 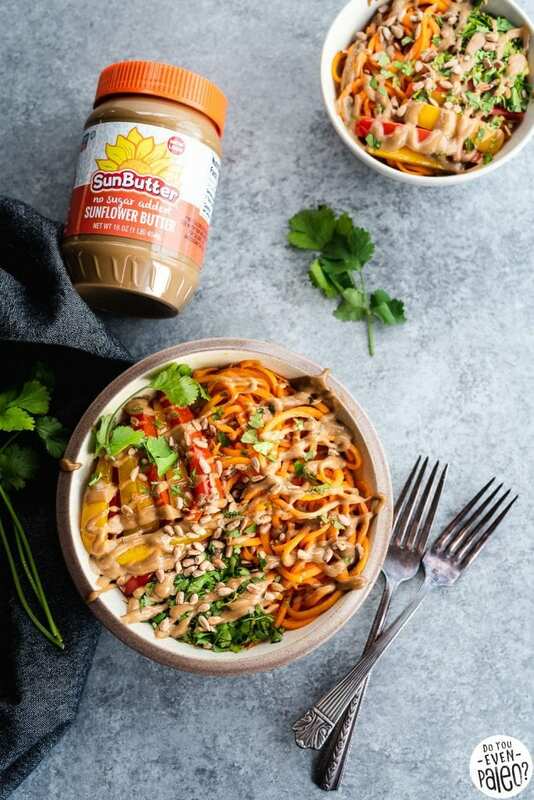 Use either No Sugar Added Sunbutter or Organic Sunbutter for the dressing, and add chicken for a protein kick! Heat olive oil in a large cast iron skillet over medium-high heat. Add the sweet potato noodles and bell pepper strips, working in batches as necessary so the skillet doesn’t overflow. Cook for 5-7 minutes, tossing with pasta tongs frequently. Remove from heat. Stir in fresh basil. Split the veggies between 4 bowls and set aside. 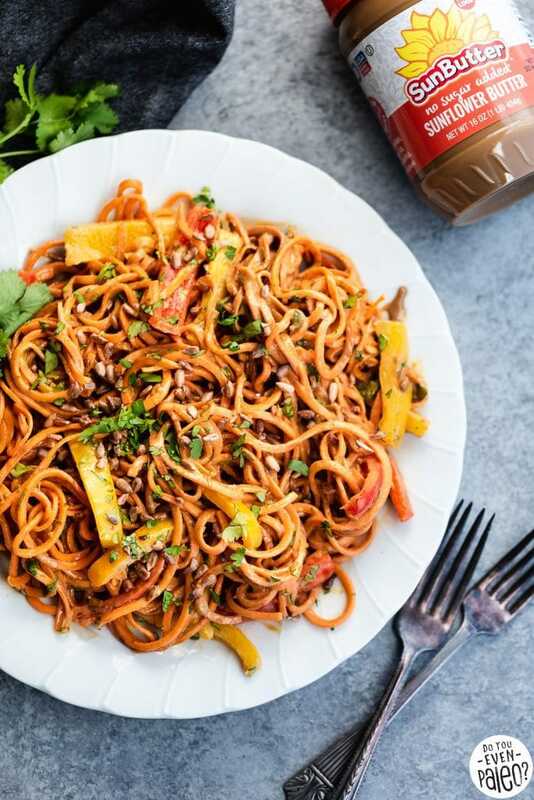 To prepare the sauce, add Sunbutter, honey, coconut aminos, fish sauce, ginger, rice vinegar, sesame oil, and red pepper flakes to a bowl. Mix until smooth. If mixture is too thick for your liking, add coconut milk 1 tablespoon at a time until desired consistency is reached. I like it pretty thick! Drizzle about 1/4 cup of sauce onto each bowl. Garnish with sunflower seeds, cilantro, and scallions. You mention to add red curry paste but that is not listed in the recipe. How much should be added? My mistake! I originally planned to include red curry paste in this recipe, but after testing decided to take it out. I’ve updated the recipe to reflect that. Sorry! Thank you! Can’t wait to try the recipe. I had something similar at a local restaurant and wanted to try to recreate it. Awesome! Let me know how it compares! Don't subscribe All Replies to my comments Notify me of followup comments via e-mail. 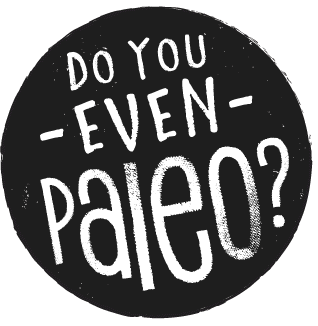 You can also <a href='https://www.doyouevenpaleo.net/comment-subscriptions/?srp=6765&srk=87505361eee98908ddf6ccb8681f50d6&sra=s&srsrc=f'>subscribe</a> without commenting.